â— Coadministration of multiple doses of zafirlukast (160 mg/day) to steady-state with a single 25 mg dose of warfarin (a substrate of CYP2C9) resulted in a significant increase in the mean AUC (+63%) and half-life (+36%) of S-warfarin. The mean prothrombin time increased by approximately 35%. The pharmacokinetics of zafirlukast were unaffected by coadministration with warfarin. â— Coadministration of zafirlukast (80 mg/day) at steady-state with a single dose of a liquid theophylline preparation (6 mg/kg) in 13 asthmatic patients, 18 to 44 years of age, resulted in decreased mean plasma concentrations of zafirlukast by approximately 30%, but no effect on plasma theophylline concentrations was observed. â— Coadministration of zafirlukast (20 mg/day) or placebo at steady-state with a single dose of sustained release theophylline preparation (16 mg/kg) in 16 healthy boys and girls (6 through 11 years of age) resulted in no significant differences in the pharmacokinetic parameters of theophylline. â— Coadministration of zafirlukast dosed at 40 mg twice daily in a single-blind, parallel-group, 3-week study in 39 healthy female subjects taking oral contraceptives, resulted in no significant effect on ethinyl estradiol plasma concentrations or contraceptive efficacy. â— Coadministration of zafirlukast (40 mg/day) with aspirin (650 mg four times daily) resulted in mean increased plasma concentrations of zafirlukast by approximately 45%. â— Coadministration of a single dose of zafirlukast (40 mg) with erythromycin (500 mg three times daily for 5 days) to steady-state in 11 asthmatic patients resulted in decreased mean plasma concentrations of zafirlukast by approximately 40% due to a decrease in zafirlukast bioavailability. Cases of life-threatening hepatic failure have been reported in patients treated with ACCOLATE. Cases of liver injury without other attributable cause have been reported from post-marketing adverse event surveillance of patients who have received the recommended dose of ACCOLATE (40 mg/day). In most, but not all post-marketing reports, the patientâ€™s symptoms abated and the liver enzymes returned to normal or near normal after stopping ACCOLATE. In rare cases, patients have either presented with fulminant hepatitis or progressed to hepatic failure, liver transplantation and death. In extremely rare post-marketing cases, no clinical symptoms or signs suggestive of liver dysfunction were reported to precede the latter observations. In rare cases, patients on ACCOLATE therapy may present with systemic eosinophilia, eosinophilic pneumonia, or clinical features of vasculitis consistent with Churg-Strauss syndrome, a condition which is often treated with systemic steroid therapy. These events usually, but not always, have been associated with the reduction of oral steroid therapy. Physicians should be alert to eosinophilia, vasculitic rash, worsening pulmonary symptoms, cardiac complications, and/or neuropathy presenting in their patients. A causal association between ACCOLATE and these underlying conditions has not been established (see ADVERSE REACTIONS). The safety of ACCOLATE at doses of 10 mg twice daily has been demonstrated in 205 pediatric patients 5 through 11 years of age in placebo-controlled trials lasting up to six weeks and with 179 patients in this age range participating in 52 weeks of treatment in an open label extension. 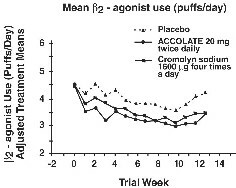 The effectiveness of ACCOLATE for the prophylaxis and chronic treatment of asthma in pediatric patients 5 through 11 years of age is based on an extrapolation of the demonstrated efficacy of ACCOLATE in adults with asthma and the likelihood that the disease course, and pathophysiology and the drugâ€™s effect are substantially similar between the two populations. The recommended dose for the patients 5 through 11 years of age is based upon a cross-study comparison of the pharmacokinetics of zafirlukast in adults and pediatric subjects, and on the safety profile of zafirlukast in both adult and pediatric patients at doses equal to or higher than the recommended dose. A comparison of adverse events reported by â‰¥1% of zafirlukast-treated patients, and at rates numerically greater than in placebo-treated patients, is shown for all trials in the table below. Rarely, elevations of one or more liver enzymes have occurred in patients receiving ACCOLATE in controlled clinical trials. In clinical trials, most of these have been observed at doses four times higher than the recommended dose. The following hepatic events (which have occurred predominantly in females) have been reported from postmarketing adverse event surveillance of patients who have received the recommended dose of ACCOLATE (40 mg/day): cases of symptomatic hepatitis (with or without hyperbilirubinemia) without other attributable cause; and rarely, hyperbilirubinemia without other elevated liver function tests. In most, but not all postmarketing reports, the patientâ€™s symptoms abated and the liver enzymes returned to normal or near normal after stopping ACCOLATE. In rare cases, patients have presented with fulminant hepatitis or progressed to hepatic failure, liver transplantation and death (see WARNINGS, Hepatotoxicity and PRECAUTIONS, Information for Patients). In rare cases, patients on ACCOLATE therapy may present with systemic eosinophilia, eosinophilic pneumonia, or clinical features of vasculitis consistent with Churg-Strauss syndrome, a condition which is often treated with systemic steroid therapy. These events usually, but not always, have been associated with the reduction of oral steroid therapy. Physicians should be alert to eosinophilia, vasculitic rash, worsening pulmonary symptoms, cardiac complications, and/or neuropathy presenting in their patients. A causal association between ACCOLATE and these underlying conditions has not been established (see PRECAUTIONS, Eosinophilic Conditions). In pediatric patients receiving ACCOLATE in multi-dose clinical trials, the following events occurred with a frequency of â‰¥ 2% and more frequently than in pediatric patients who received placebo, regardless of causality assessment: headache (4.5 vs. 4.2%) and abdominal pain (2.8 vs. 2.3%). Patients with Hepatic Impairment: The clearance of zafirlukast is reduced in patients with stable alcoholic cirrhosis such that the Cmax and AUC are approximately 50 - 60% greater than those of normal adults. ACCOLATE has not been evaluated in patients with hepatitis or in long-term studies of patients with cirrhosis. 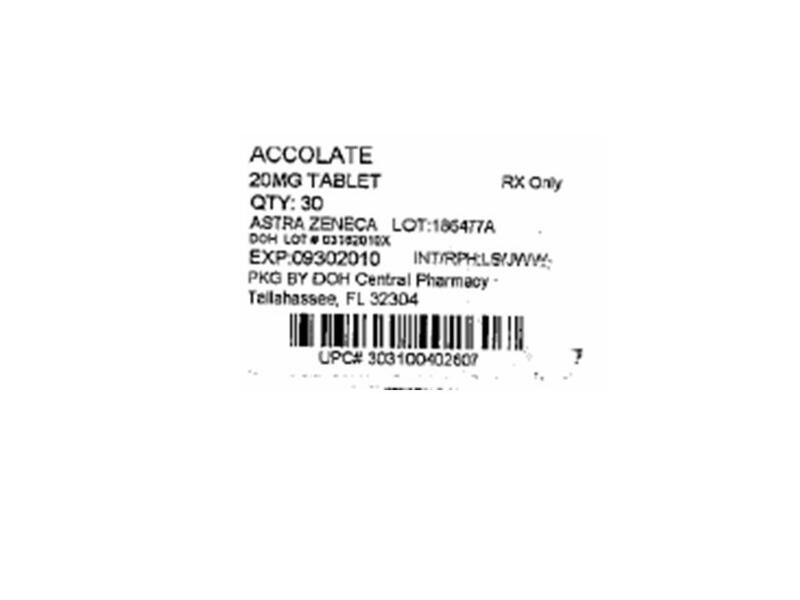 ACCOLATE 10 mg Tablets, white, unflavored, round, biconvex, film-coated, mini-tablets identified with â€œACCOLATE 10â€ debossed on one side. ACCOLATE 20 mg Tablets, white, round, biconvex, coated tablets identified with â€œACCOLATE 20â€ debossed on one side are supplied.